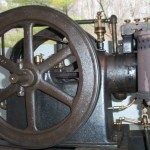 Falk 3 HP volume governed sideshaft engine 1910-1912 or there after. 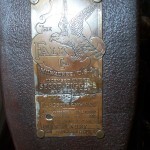 This Falk engine tag reads: The Falk Co. Milwaukee Licensed under SECOR-HIGGINS System of Oil Combustion Kerosene Engines 1907 Engine # A 987 3 HP 560 RPM. 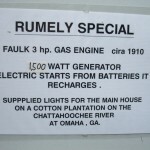 Rumley started building Falk engines in 1912 and at some point before 1915 the engines were re named Rumley / Falk. The engine is igniter fired, has a fuel pump, both valves are driven from cams on the side shaft, the governor is also on the sideshaft, cooled from the cooling tank and sitting on its original wood skid. 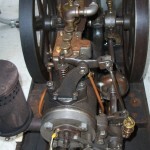 The Dynamo is belt driven from the engines flywheel. It is also high quality with the bearings being lubricated by the oil contained in reservoirs located below the bearings. The original switch board is mounted on the sidewall of the trailer, beside this is an up to date fully fused electrical panel. 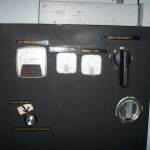 The original panel reads: Rumely Automatic Switchboard Pats. pending by the W. L. Co. 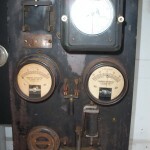 Size 1,500 / Volts 110 (DC) Plant #150 Serial #2067 Rumely Products Co. Laporte Ind. 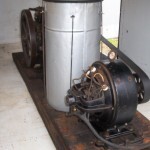 This Falk engine, cooling tank, dynamo, Rumely switchboard and wooden skid were installed near the Chattahoochee river for home electrical power on an Omaha Georgia Cotton Plantation, some time around 1910. I had this Falk / Dynamo project ongoing at my shop for several years before completion in 2008. The decision was made to use up to date control equipment to make sure this power plant could be operated safely. 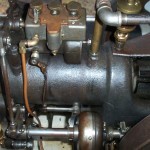 The engine was restored using a new fuel tank which is mounted in the engines base. Most of the lubricators are Lunkenheimer. The original cooling tower was restored and a lid added. The cooling water does not have to be drained when traveling to and from shows during the summer months. To start the engine: see instructions in the photos. 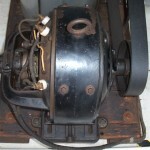 After the engine starts, the Dynamo is changed from starting to maintaining a proper charge level in the batteries and illuminates the ceiling lights in the trailer. The batteries are mounted in the floor with easy access from inside the trailer. The Homesteader “Hercules” trailer was last tagged in 2014 and was kept inside when not at shows. 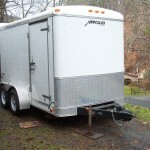 Interior measures 5′ 8″x 12′, overall length is 16′ and the trailer ball size is 2 5/16″. The doors are 6′, walls are paneled, tire size ST 205/75R15 with tandem torque flex axles, E-Z lube hubs and 4 wheel brakes + new spare tire and wheel. The estimated weight for this complete outfit is 2,280#. Weighed at our local quarry December, 2014.